We were talking with some of our neighbours on the Ivybridge Estate, when the idea of a meeting place that actively welcomed people from the melting pot of nationalities represented on the estate, was suggested. With assistance from Near Neighbours, we’ve been able to make this idea a firm reality. We have a small group of regulars, from a variety of backgrounds, coming together for friendship and joining us in building a shared sense of community. 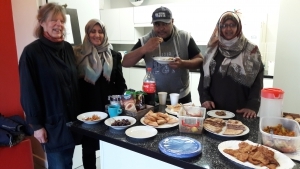 We enjoy eating different foods, ranging from Busboosa to cream teas, and participate in varied activities, including talks, crafts and community themes. The Cooking Pot takes place at the Bridgelink Community Centre, on Wednesdays 10am-12pm during term time, and anyone is welcome to join us.